Time magazine published a list of the top 100 gadgets since 1923 and gaming handhelds and platforms were extremely well represented. Because of Moore's Law, a lot of gadgets were invented in the 20th century and the first decade of the 21st. Time magazine decided to list only the 100 best since the publication began in 1923, leaving off such gadgets as "the wheel, the lever, the telescope." Despite that caveat, the list contains more than a few no-brainers like Apple's iPod, Sony's Walkman and the Zippo lighter (virtually unchanged in design since it was introduced in 1933). While no home gaming consoles made the list, gaming handhelds were extremely well-represented with the Atari Lynx, Nintendo's Game Boy and my favorite, Mattel Electronics Football. Other notable nerd-centric gadgets on the list were the Commodore-64 (the best-selling PC ever), and everyone's favorite way to phone home, the Speak & Spell from Texas Instruments. Nintendo's Game Boy was one of the most successful gaming products ever and arguably launched the handheld market in the 80s. Not only did the Game Boy sell over 118 million copies worldwide, it was also inducted into the Strong Museum of Play's National Toy Hall of Fame in 2009. 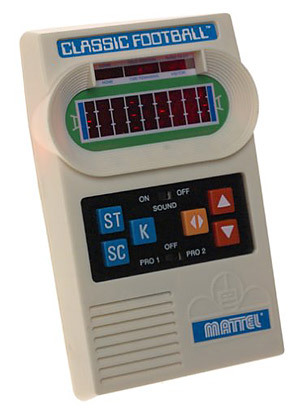 I played the crap out of my family's Mattel Electronics Football, even though the gameplay was incredibly simple. For those of you who may not have seen it in action, the display was a 3 x 9 grid which allowed you to hike the football, run past defenders or attempt a tricky pass down field. Your team was bright red, while the defenders were less illuminated. For some inexplicable reason, those little LED blips of various brightness rushing around on the field occupied my attention for hours on end. Just don't throw the ball over any defenders; those bastards have some sticky fingers. You may not remember the Atari Lynx, but Time rightly puts it in the "ahead of its time" category. The Lynx boasted a full-color screen, but its $185 pricetag, when the competing Game Boy cost a little over half that in 1989, doomed the Lynx to lackluster sales. Atari's innovative handheld also lacked sufficient software and it was shelved along with the Atari console production business. Perhaps the coolest feature of the Lynx was that it didn't matter if you were left-handed; the console could be modified to fit our southpaw brethren. There are a lot of cell phones and computing innovations on the list, but the ones listed above were the most gaming-centric. Time made no distinction between the 100 picks; there is no ranking of #1 or #100 for example. But people can vote on whether they believe that Time got it right by giving a gadget pick 1 through 5 stars. So far, the iPod and the Kindle are leading the voting but the Game Boy isn't far behind. Check out the entire list here. Did Time get the list right? What gadget should be added? Which one shouldn't be on the list at all?